India Today has learnt that the two countries and industries on both sides are discussing the Rupee-Ruble arrangement as payment and transaction methods to have uninterrupted economic, trade and defence cooperation. 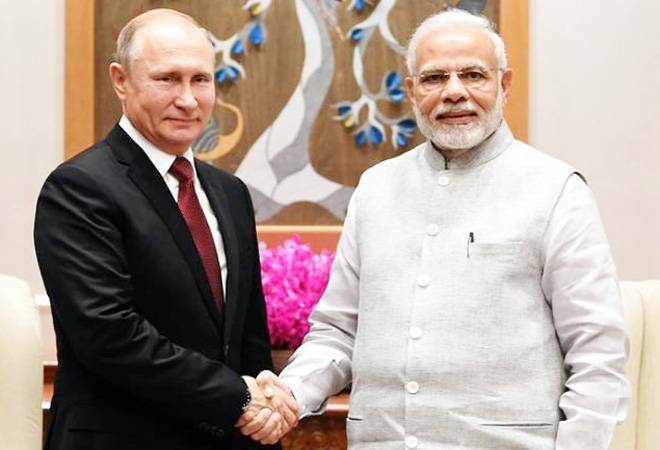 President Putin's visit to New Delhi for the annual bilateral summit is focussed on taking forward the understanding reached between Prime Minister Modi and President Vladimir Putin at the informal meeting in Sochi. With the US administration breathing down India's neck with sanctions under CAATSA and no presidential waiver in sight, India is still going ahead with multilateral-billion dollar deals with Russia emphasising the importance of India-Russia strategic partnership. Ahead of the Russian President's arrival, his top foreign policy aide Yury Ushakov had confirmed that the Russian President will oversee the signing of the S-400 air defence systems deal. The first official confirmation from the Russian government at the highest level of the deal, which is worth more than $5 billion. A major part of discussion between government-to-government and business-to-business has been the eventuality of any form of sanctions by the US that could restrict trade between the two countries. Speaking to India Today, Gasprom Bank's Representative in India Sergey Mitreykin said that the banking communities had been talking about this arrangement for the past two-three years and now because of the current environment taking, it was time to take some practical steps instead of just discussing them. "I am absolutely certain that it is a totally workable solution. The only issue is that everybody is used to working in dollars, the framework is there, bank accounts and processes are in place; in Rupee-Ruble you would have to set that up which would take some time and cost. So, the sooner two commercial parties decide to look at this arrangement, they will have to do some homework and incur some cost but it will take off without a problem", he said. Instead of using dollars, the two nations are looking at the Rupee-Ruble arrangement or some other currency which is not affected by the Americans. Russia has been pushing for this mode of payment for a while but India has been reluctant given the depreciation in Ruble in the past years. But Andrey Slepnev, Director of Russia Export Center, struck a positive not and dismissed US actions as "illegal" and reaffirmed the need for continuity in bilateral cooperation between India and Russia. "We do hope that illegal measure against Russian federation would not touch upon the goodwill to continue our cooperation. Of course, trade in national currencies has been a trend for quite a while. It was used before also when sanctions were in place" said Slepnev. Both the leaders are likely to sign about 20 pacts in areas ranging from defence, nuclear energy, space and economy, including the S-400 air defence systems deal on Friday. One of the announcements would be holding of the joint India-Russia counter-terrorism exercise, Indra-2018, set to be held from November 18 to 28, 2018. The US is watching this visit very closely. Trump administration only last week slapped sanctions against China which was the first foreign buyer to procure the lethal missile system in 2014. While America's line has only hardened, former diplomat who served in Moscow Ambassador Anil Trigunayat is more optimistic of how things could pan out for these "strategic" partners of India. India is much too important and a huge defence market for US to let go off over one deal is how this former Indian diplomat puts it. Alluding to the fact that CAATSA is only a way to grab larger part of the Indian defence pie, Ambassador Trigunayat said, "S-400 is essential for us. We have informed the Americans. While I am not privy to the negotiations, but from what I can read, US understands that this is not a deal which cannot be waived. They will have to allow it to go through. With CAATSA, they are looking for their pie. They want to sell their THAAD and other equipments." The Russian head of the state, who is accompanied by a high-level delegation, was received by External Affairs Minister Sushma Swaraj in New Delhi on Thursday. He later was hosted for dinner by Prime Minister Narendra Modi at his residence, 7, Lok Kalyan Marg as both the leaders talked over a host of issues, including bilateral cooperation and strategic issues. On Friday, apart from the bilateral talks, the two leaders will address the India-Russia Business forum and interact with a group of 20 students (10 Russian and 10 Indian) from India's Atal Innovation Mission and Russia's Creative School, SIRIUS. The two countries are set to sign a Memorandum of Understanding (MoU) that will facilitate collaboration in the field of science and technology between India's Atal Innovation Mission and Russia's Creative School, SIRIUS. Named after former Indian Prime Minister, Atal Bihari Vajpayee, the Atal Innovation Mission (AIM) is a flagship initiative school set up by India's policy think tank NITI Aayog to promote innovation and entrepreneurship among future generations.